Today – some Friday Fiction! A short story from me, in the world of ‘Hopeless, Maine’ (given life by the amazingly talented Tom and Nimue Brown, and endorsed by Neil Gaiman, amongst others). I’ve found the constant wetness to reflect my emotional state recently – ebbs and flows, rushing waves and standing puddles. But as the Spring begins to approach, as I see the buds and hear the birds more frequently, there is a definite change in the air. Imbolc is upon us. Brigid is at the door. Imbolc has been one of the more elusive festivals, for me. What is it about, really? It comes at a midpoint in seasons, during dark days which it’s hard to believe are growing lighter. As a creative person, I’ve always felt that I should be connecting to the Lady of Inspiration a little more strongly, but the gods of these islands have been tricksy as well. Distant Classical deities? No problem. So-called ‘Celtic’ (I really do not like that term! ), however? There’s more to them than meets the eye. Perhaps this is as it should be. These aren’t just archetypes, after all – these gods are real people, more than just their ‘duties’. They require you to investigate, get to know them, read the stories but also draw your own conclusions, reading between the pages to see what’s really going on. I’ve written before about folk who think the Morrigan is just ‘bad’ – a point of view which baffles me. So how can a deity of Inspiration be clear-cut and straightforward? It took Nine Muses for the Greeks to sort this concept out! This year, Brigid came to me in the form of a request. I’ve been knitting prayer shawls for some time now, taking the idea of a ritualised act of creativity to help another and seeing where it takes me. Each shawl is entirely unique, its’ own personality almost, with the ‘spell’ of its undertaking beginning at conception of idea, through to final sewing up and wearing. A large and complex task, but tremendously fulfilling. Sometimes they just come to me as ideas; sometimes through the dreams of others. A lovely lady, friends through the connectivity of the Internet, asked me to make her something special. Emails zoomed back and forth, ideas of concept and purpose, then texture and colour, yarn, beads… until this week, it was finally resolved. And in the manner of all the best rituals and magic, everything came together at the right time, as if we were guided – because we had our eyes open and were looking with purpose, yes, but I’ve absolutely no doubt that there was a hand at my shoulder. 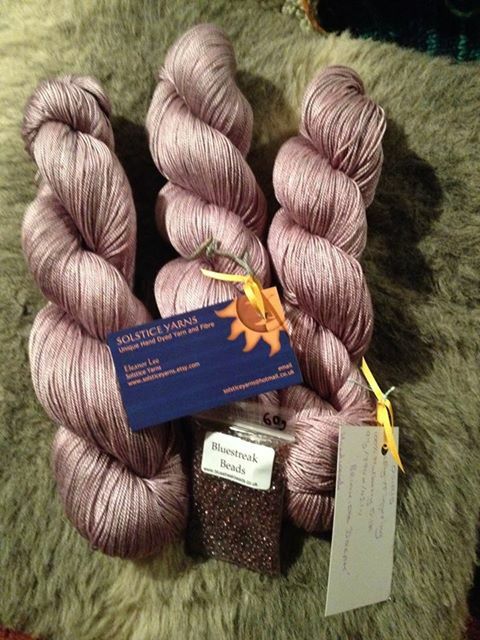 The yarn is pure silk, delicate yet strong, hand-dyed by another talented creative at Solstice Yarns. It is called ‘Brigid’s Dream’. The shawl is begun at Imbolc. I’ve performed ritual to set intention and ask for guidance, but it’s almost as if I don’t need to. I know what I’m to do, because the Lady is there, smiling as I twist that first loop onto the needle. I’m sure some may sneer at this, as if I’m making more out of a simple knitting commission than I should. But the purpose here is key. This is a prayer shawl, to be valued for what it is as well as what it does. Practical – warm, enveloping, soft to touch and beautiful to the eye – but also blessed throughout its creation. This is real magic, flowing through my fingers. I’m one of those working to make it come to life. I’ll be working on this as the days grow longer again, the buds burst into flower, the inspiration starts to flow again with the new life. This creation will blossom too, and I’ve no doubt that I’ll learn things along the way (including the likelihood of tinking back occasional mistakes, especially with beading!). The water around us is not stagnant. We needn’t let ourselves drown in it. We work with it, learn from it. Without that flow, we would die. That is how I feel about my creativity. I’m the tool through which it is directed, to make something nourishing, warming… alive. Oh, and the pattern? From (you guessed it) yet another creative lady, called Boo, who allows magic very much into her designs.